3 Bedrooms/3 Baths condo, Corner Unit, Wrap around balcony! BEACHFRONT! Welcome to 'Ray of Sunshine', a delightfully furnished 3 Bedroom / 3 Bathroom luxury condo that has everything new. 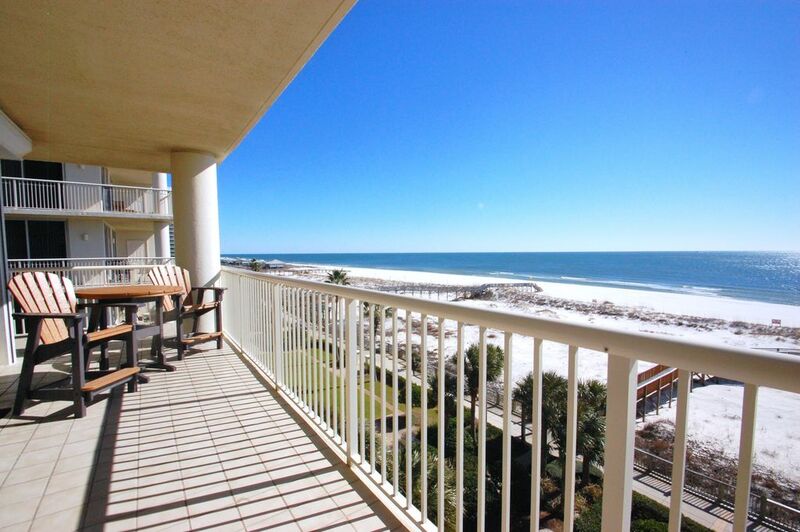 Views galore greet you from the wrap around balcony and beach front views that go for miles. 'Keep Calm & Carry On' is our motto here, as you will be relaxed and greeted by the ocean air and sun-kissed rays. Turn the key and unlock one of your favorite most memorable vacations ever! The Beach Club is one of the only destination Luxury Resorts on the Gulf of Mexico in Alabama! Our condo has just been recently remodeled with 3 new flat screen TVs, queen size sleeper sofa, new appliances, tile, carpeting, beds, bedding, and outdoor furniture. We include FREE Wifi high speed internet, FREE HD Cable, and FREE phone - domestic! The spectacular views of the aqua blue gulf water and white sands are rivaled only by the luxury of this upscale family friendly, complex with every amenity you could want for your most memorable vacation ever! This resort has been recognized as a Premier Vacation Spot with unbeatable First Class Amenities. The Beach Club offers: The Restaurant, The Palm Bar, The Village Market & Grill, The Village Mercantile (gift shop & ice cream parlor), A Spa & Salon, 8 Hydra tennis courts, a game room, basketball and sand volleyball courts, and the most beautiful beaches in Gulf Shores. Located in a gated, Southern style Village setting, but is set directly on the Gulf's beautiful beaches. Walk on the miles of beaches or on the charming boardwalk facing the beach throughout the grounds of the resort's buildings. This is truly a one of a kind property! Last minute rentals welcome and credit cards are accepted. This condo is ready for you! We include quality bed linens and bath/kitchen towels, ample dishware, and cooking utensils. Enjoy Gulf Shores' Tourist Attractions: The Bon Secour National Wildlife Refuge, Fort Morgan Historical Landmark, Golf (Kiva Dunes, Peninsula Golf Course...as well as putt-putt golf), The Hangout Restaurant, (World Famous) Lulu's, Tanger Outlet Malls, and so much more! Some resort amenities require an additional onsite amenities fee paid to the resort management. Those amenities include: indoor pool, fitness center, game room/arcade, tennis center. The condo was great for our family. It was clean and well taken care of. There were a few electrical issues we had with some outlets and the kitchen light switch wouldn't work most of the time, but other than that it was perfect. We would definitely rent again. Hi Pamela, thank you for the review. We are so glad that you enjoyed your stay at Ray of Sunshine. We do apologize that you experienced some electrical issues during your stay. We will send maintenance to check this out. Thank you for letting Harris Properties help you find your perfect spot in the sand. We hope to host you again soon! Very nice condo in a great location, well kept and awesome view of the beach and ocean. That being said, we had some issues with the marketing and support we received from Harris Properties. We were not able to contact the actual owner, which is not like any other VRBO we have done. The ad stated indoor pool gameroom and sauna, but didnt say it is $46 per day extra! 2 beds had top sheet folded up under the pillow, had to make beds at midnight. No help from harris properties with questions-they are clueless. We are a property management company and we manage homes for home owners. All of our units at The Beach Club require you to purchase the extra amenities. We are sorry you feel that this was communicated poorly. We are always happy to answer questions to the best of our ability and if we do not know the answer, we always try our hardest to find the solution. We are sorry that you did not have a satisfactory experience. Please call us in the office if you would like to further discuss your experience. We here at Harris Properties are happy to hear that you enjoyed the home Ray of Sunshine (Doral 501) during your stay with us. Thank you for the great feedback about the home and that you found this home to be spacious and accommodating. We apologize that the beds werent as comfortable and will take measures to address that. We want to apologize that we were not able to make this a 5 star review for you. In hopes that we have the opportunity to host you and your family again, we will strive to make it a 5 star vacation. Thank you for choosing Harris Properties and letting us be a part of finding your perfect spot in the sand. This is a beautiful condo and a great family atmosphere resort. I will definitely book this home on our next trip to the beach. We are happy to hear that you enjoyed the unit Ray of Sunshine (Doral 501) during your stay with us. Thank you for the great feedback about the unit and that you found it to be a beautiful condo and great family atmosphere. We look forward to hosting you and your family again soon. I had high hopes for this vacation. It has been several years since I had taken my kids back to the Beach Club. We used to come regularly when they were little. I decided that since I had both kids home for spring break and both of them getting prepared for graduation (one college and one high school) it would be so fantastic to take them back to the Beach Club. The pictures of this unit online are pretty accurate; however, there are many features of the unit that are dated and need attention (closet doors that stick or don't open, filthy area rugs and windows that are ridiculously dirty). The decor is nice; however, the most disappointing thing was that the air conditioning wasn't working AT ALL when we arrived. I'm not sure when the last rental was before ours, and although the thermostat turned the unit on, not one bit of air, cool or otherwise came out of the unit. We called Harris Property Management and got a recording. I tried calling again in the morning and got a lovely woman, Lynetta, to listen to my plea for air and she was very empathetic. The condo was a sticky, humid mess at this point and my stress level was not much better. She made some calls and told me it would be a few hours before a technician could get there, but someone would be there. About 4 hours later, we had a tech who confirmed the unit was dead. At this point we were told they needed to get authorization from the owners to install a new unit. I asked if we could be moved to another condo and was told that wasn't an option at this point. The owners ended up approving a new unit and we had a tech in there for several hours replacing it. Needless to say, we weren't thrilled with all of this and couldn't wait for it to be working so we could all dry out! The next day we had another issue as the unit above us was having work done on their condo and the repair guys used a hammer drill for two hours! if you are not familiar with a hammer drill, it sounds like a jackhammer and it was deafening -- we would have gone to the beach if it weren't for the tornado warnings and torrential downpour (I'm not kidding nor exaggerating). We made calls and after two hours the sound stopped (not sure if they were done or if someone was able to make them stop). Harris did give us a partial credit for our stay, but I'm truly amazed that they didn't do more -- we truly only had 1 day where we were able to enjoy the unit. I apologize for the inconvenience that your vacation was no what you were hoping for and that the A/C was an issue during your stay. We were able to replace the A/C unit and apologize that it did take longer than expected. We would like to host you and your family again soon, and would like the opportunity to make your next vacation better. Gulf shores and the Fort Morgan area are beautiful. I would definitely recommend the Fort Morgan area due to the amazing beach. Our condo unit did have a beautiful view but a few things were not up to standards. We could not get the TV to work for two days and I had to troubleshoot it on my own to finally figure it out. Our oven did not work the entire time we were there, and in fact, they delivered a new one on our last day. There were also some dirty dishes in the cupboards. The sleeper sofa was horrible to even sit on; you could feel the springs. The kitchen was well equipped, but I think it is a joke that only one roll of TP is provided for each bathroom, no kleenex, one roll of paper towels. You pay that much for a week stay and they can not supply basic necessities, including dish soap and dishwasher detergent. We plan on returning to the Beach Club next year, but will be looking for a different unit. I want to apologize that you found a few things not up to your standards; however, we do strive to make our guests feel comfortable. The stove was delivered and I am sorry that it was on the last day of your stay. I have passed on the information to the owner about the sofa sleeper. The items that you have mentioned that should be provided by the cleaning company is a standard for all cleaning companies. They cleaning company leaves the complimentary trial dish soap, dishwasher soap, bottle of detergent, and various other items as listed in the booking packet. Again, I apologize that your stay was not a pleasant one; however, we hope to help you find that perfect spot in the sand and will allow us to host you again.